This is a collection of some of the greatest and most poignant expository thoughts on the 4 Gospels. 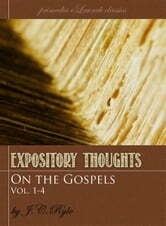 Ryle examines the text thoroughly and carefully which results in sound biblical teaching. If you are a pastor, teacher, or just someone wanting to learn more about the Gospels, this collection is for you.